An invaluable set of ‘G shape’ based ‘cheat’ substitute chords with one finger chord changes that you can use for any song in any key, even a cheat for a B minor chord, all without having to play any barre chords! A years’ worth of worship guitar instruction on 4 DVDs including animated graphics, close-up shots and daily practice backing tracks. Suitable for acoustic and electric guitar. What’s new in this DVD set? 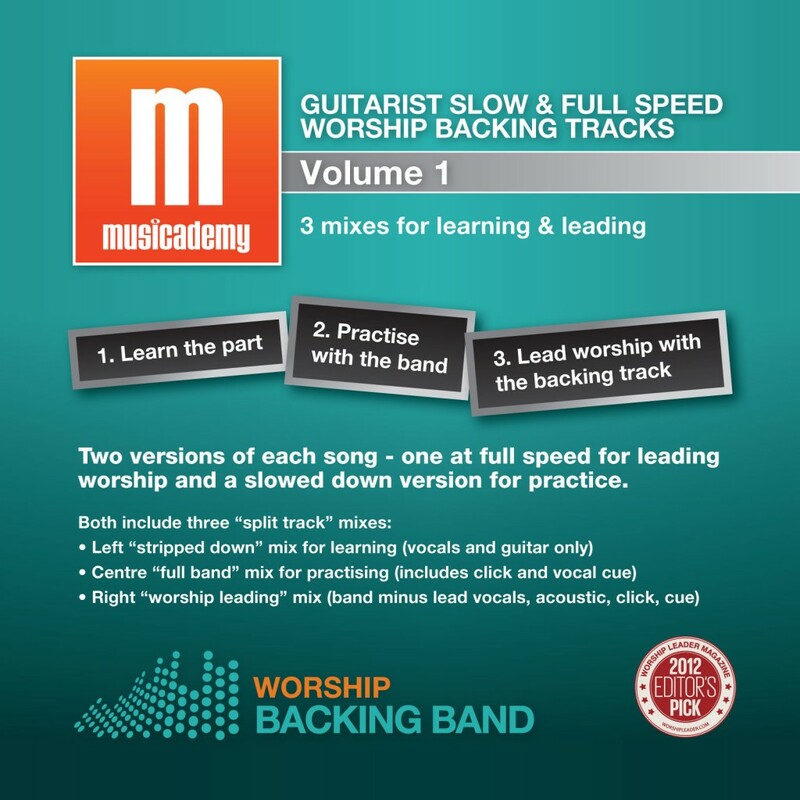 A download-only set of 20 worship guitar lessons suitable for existing players. Each individual lesson teaches you a well known worship song. Even if you know how to play the song already you’ll pick up a host of new tips and ideas in these lessons from Musicademy’s Andy Chamberlain. Perfect for acoustic worship guitarists who want to take their playing to the next level. Plus daily practice backing tracks, how to use high strung and baritone guitars in worship and an acoustic guitar buyers guide. You can also buy this DVD as a series of 12 downloadable lessons. A 10-hour, 4-DVD course for electric guitarists who want to take their skills and creativity to the next level. Also perfect for acoustic guitarists who want to transfer to electric. Find any capo position in any key using familiar chord shapes. Transpose chord charts with complex chords into guitar friendly keys. No knowledge of music theory or reading necessary! The Song Learner series turns a worship song into a 20-30 minute guitar lesson, unlocking the unusual chord shapes, cheats and rhythms used in the original recording. Then instantly apply these new techniques to many other songs. Learn new, easy to play “cheat” worship guitar chords that the pro’s use. Each low cost video download is a complete guitar lessons teaching you a contemporary worship song. These will enable you to master appropriate strumming patterns, find easy shapes for complex sounding chords, cheats for quick chord changes, plus hints, tips and techniques which will further your playing beyond learning the song itself. The Song Learner Series is ideally suited to students who have completed the Beginners Worship Guitar DVDs but are not yet ready for the more advanced teaching of the Intermediate DVDs. Each lesson is so much more than a quick run through of how to play the song. As experienced educators, we at Musicademy realise that many students need to have the information broken down, repeated slowly and then consolidated in the context of a song. The DVDs demo every song section and play it through a few times before each element is bolted together step-by-step. Using this method helps you get each sequence into muscle memory as quickly as possible. Many of the songs are also available as online downloads. These are half price when buying 10 or more lessons. Exclusive guest lesson with Stu G from Delirious? A years’ worth of worship guitar instruction on 3 DVDs including animated graphics, close-up shots and daily practice backing tracks. Suitable for acoustic and electric guitar. Here is a detailed description of the difference between the old and new Beginners Guitar Courses. A whole year of worship guitar lessons on 3 DVDs including animated graphics, close up shots and daily practice backing tracks. Suitable for competent worship guitarists who need a new range of techniques to enhance their playing style and creativity. Great if you have hit a plateau in your worship playing skills. Exclusive guest lessons with Stu G from Delirious? For every song you also get two versions. One at a slowed down pace designed to help you practice the chords to and a split track version at regular speed.